New York is one of America’s most progressive bike cities. On one hand that makes perfect sense. As the biggest, fastest-paced city in the country it has always drawn forward-thinking, ambitious people; why not forward thinking, ambitious bike advocates? On the other, it’s kind of insane. New York has a sociopathic driving culture, a police force and political establishment historically apathetic to the idea that fatal crashes are anything but accidents, and millions of drivers, bicyclists, and walkers all vying for the same small space. Yet over the last decade, Manhattan and parts of Brooklyn have been remade into great places for biking and walking with protected bike lanes, pedestrian plazas, and more and the advocates at Transportation Alternatives (T.A.) have been there every step of the way. Recently they’ve turned their attention to Vision Zero, a radical notion that traffic deaths in New York are completely preventable. Given that the city is still averaging between 200-300 fatal bike, pedestrian, and car crashes annually, they have a long way to go. But T.A. Executive Director Paul Steely White says the Vision Zero framework they’ve laid out can get them there if they can garner the political support and capital funding necessary. I spoke to White about his history in New York City advocacy, his role in one of America’s most influential advocacy organizations, the “golden years” of New York City bike advocacy, transforming transportation with Vision Zero, and much more. How did you get your start in bike advocacy? I started in environmental science. I went to grad school at University of Montana to study grizzly bear habitat. While there, I realized the future of environmentalism is in cities and that the fate of homo sapiens rests largely on our ability to congregate in dense settlements and live with fewer resources. It wasn’t a huge leap for me to realize that my long love affair with the bicycle was a way to embrace that urban future of environmentalism in a meaningful way. My advisor encouraged me to do an independent study with our local bike ped office in Missoula. I became versed in the federal funding of local bike projects. Missoula has these crazy air inversions. For a relatively small town they had a really bad air quality problem, so there was funding there to build out the bike network, do some traffic demand management, and do what they could to improve transit. In my second year of grad school, I started corresponding with Jon Orcutt here in New York City. Jon at the time, I think, was on the board of the Institute for Transportation and Development Policy (ITDP). I also got acquainted with Karen Overton at ITDP. I ended up volunteering for a Bikes for Mozambique project where they were shipping bikes from New York to women farmers in Mozambique so they could use bikes for better self sufficiency and increase their productivity. We ended up raising money to ship bikes to South Africa and Mozambique. That long-range correspondence and fundraising effort turned into an opportunity to do a thesis project in New York and in South Africa the summer of ’97 to evaluate a project where bikes were micro financed to subsistence traders in South Africa. That ended up being a lot of fun. I came to New York, drove a UHaul truck to collect used bikes from garages and basements in Westchester County, then we shipped them to Africa. I got to go over there and help on the other side to get them in a state of good repair, distribute them, then do an analysis of how the bikes were helping people economically. I came back to New York after a couple months of doing that. Walter Hook, who was the director of ITDP, said, “hey, if you can raise your own money, you can have a job here.” I did what I could to report the study results and engender some more grant funding. I worked for ITDP for 7 years. I had a great time working in India on a rickshaw modernization project, doing a bit in Latin America and getting to know Enrique Peñalosa and what he was doing there, and working throughout Africa. Then the job at T.A. became available and I just jumped on it. It was a dream come true to even have a shot at working at T.A. They’re such a storied organization and activism is in their DNA. But they also have a long history of being a very cogent policy shop as well. It’s an amazing one-two punch. I saw my job as really doubling down on T.A.’s legacy as an activism and policy-focused nonprofit. For people who don’t know, how would you describe T.A.’s work and some of its major bonafides? T.A. was founded in the early ’70s in that flowering of environmental consciousness around the Clean Air Act and the realization that the car had gone way too far in the American metropolis. Over the years, T.A. has had a great number of successes. Most before my time. For example: Bikes on the subway. Bike paths over all the East River bridges. The first pieces of bike network that were won in the 70s and 80s. The greenway plan was huge. It was developed in the late 80s and early 90s and culminated in the nation’s busiest bike path, the Hudson River Greenway. T.A. introduced Safe Routes To School in the United States. Safe Routes to School was first pioneered in the south Bronx, again well before my time. I think that was really a model for Safe Routes projects. Instead of just encouraging people to walk and bike to school, it was about actually making it possible to do so safely through traffic calming. T.A. played a really key role in bringing traffic calming into American consciousness. The story of T.A. over the years has been focused on New York City. We’re a five-borough organization. But anything we do here has enormous ramifications for cities around the country and even on federal policy, ultimately. New York being what it is, it’s always been a happy dividend of our work that it’s often mainstreamed. Paul Steely White and Congressman Joe Crowley ride through Queens. Photo via foresthilltimes.com. Maybe this is too big an assumption, but I think a lot of people are familiar with New York’s tremendous progress towards becoming a bike friendly place during the Janette Sadik-Khan years (2007-2013). Was there any one most important thing that happened at that time to change the way the city approached bike infrastructure? There’s certainly no shortage of magnificent projects that materialized during what you might term the golden age of bicycling in New York City under Mayor [Michael] Bloomberg and [NYC DOT Commissioner] Janette Sadik-Khan. The 8th and 9th Ave bike lanes, the reclaiming of Broadway, 1st and 2nd Ave, expanding the bike network in to the Boroughs a bit, the greenway network largely coming into its own, outlining and realizing bike share. But I think the most significant development by far was having a mayor who really decided to make bicycling a legitimate, desirable part of our transportation system. Before then it always took a Herculean effort just to win the smallest sliver of bike lane or traffic calming or anything that deigned to give this valuable public space to those who use it more efficiently. 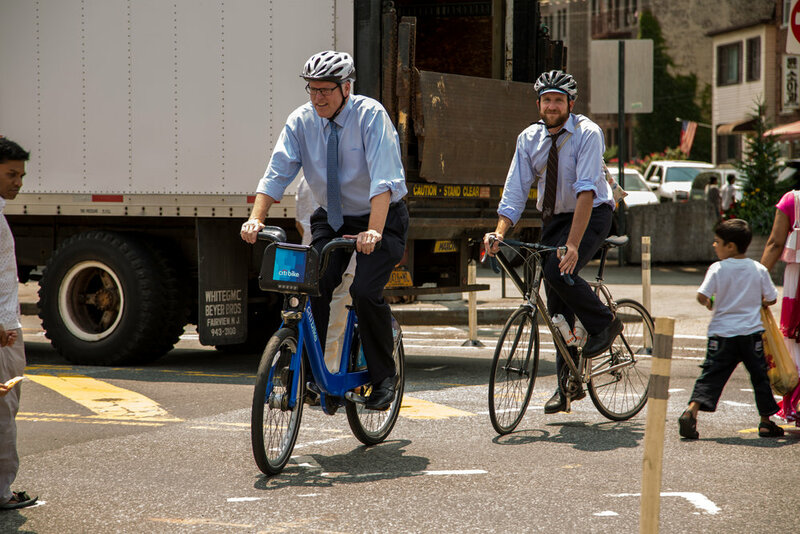 Then all of a sudden–or it seemed like all of a sudden–Mayor Bloomberg appointed Janette and put bicycling and sustainable transportation securely within his PlaNYC sustainability framework. It was like bam, we had clearly gotten over the hump. It became a very different game after that to finally be on the inside in many ways. There were some differences of opinion within the movement whether or not that was a permanent shift or whether it was in danger of being rolled back. We took that threat very seriously when Mayor Bloomberg’s tenure neared its end and by all accounts Janette was also moving on. You had then mayoral candidate Anthony Wiener talking about ripping out the f’ing bike lanes. There were still a lot of people associating bicycling with something uniquely Bloombergian or something controversial. It was a real important moment for the movement and the organization. Could we move into the next era, transition to the next mayor and commissioner? Keep the gains we’d made, but also keep progressing. And do you feel like you were able to transition into Mayor de Blasio’s tenure? I think the answer was ultimately yes. Because of the tremendous work that our staff, board of directors, Streetsblog, lots of local organizations, really the whole community of activists in New York City. 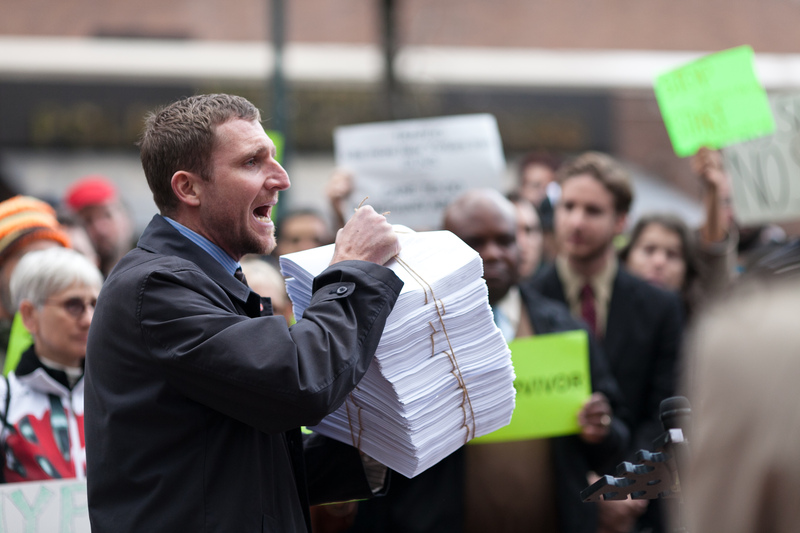 We had the advent of StreetsPAC, a separate organization that was endorsing candidates. It was really this amazing movement that we have in the city that pulls together and understands that it’s not about promoting bicycling, per se, it’s really about promoting a progressive transportation policy at the center. And that, of course, is what Vision Zero’s all about. I think that’s why today to be a successful bike advocate really means first being a successful traffic safety advocate. It’s amazing to see how in cities around the country now, bike advocates are forcing the leading edge of traffic safety. We’re out there on the street, risking our lives every day, understanding the dysfunction of city streets from a uniquely first-hand perspective. It’s all a way of saying we’ve come a long way in New York. Getting back to your question about the golden era, it was just a really productive partnership between advocates and a newly-sympathetic administration and seeing that the game had suddenly changed to where there was an inclination from the administration and the commissioner to really do the right thing. It was a matter of us lowering the political cost of some of the improvements they wanted to do and marshaling more people in favor of them than were going to speak against. After we had sort of co-catalyzed a lot of those improvements with the commissioner, it became our job to really defend them and prove that they were working. And we did that a number of ways. Obviously people were using those facilities. But we had to defend them in the press. We had to marshal turnout at community board meetings. And ultimately the game became making sure the political class in New York understood that it was good politics to pursue pro-bikes, pro-people transportation policies. Then of course, the ultimate advocacy powerhouse was Families for Safe Streets. All of a sudden the most powerful voices for transportation policy were the very people who had lost loved ones in traffic. Their moral authority and their courageous advocacy carried the day because no one could say no to them and they just didn’t take no for an answer. That golden era of new infrastructure obviously had a positive impact on safety, yet there’s still huge numbers of people getting hurt and dying. Are New York City streets actually on their way to becoming safe for pedestrians and bicyclists? Yes and no. I mean we have the Vision Zero framework now which is historic and potentially transformative. But in terms of actually moving the needle, we’re very far from Vision Zero. We had 19 bike fatalities in 2014. That’s the highest number we’ve had in several years. I think it’s telling when you look at those fatalities, virtually all of them have happened outside of the city bike zone and the cohesive network we now mostly have. The Boroughs–outside the core of Manhattan and the denser part of inner ring Brooklyn–have a real dearth of lanes. You have speeding traffic. A lot of sociopathic driving behavior. That’s where the safety problem really resides now. It’s not to say it’s not a city-wide thing. But we have about 60 percent of our fatalities–driver, pedestrian, cyclist–happening on these big, scary streets that represent only about 10-15 percent of the street network. Whether or not we’re going to be successful with Vision Zero has everything to do with how those streets are designed. We still have this legacy of highway-era urban arterials that are just as deadly as the deadliest virus. We know what the vaccine is: a Complete Street redesign. That of course requires capital dollars so the biggest question for us in 2015 is whether or not the city will actually provide the necessary financial resources to redesign those streets. That will be a really important test as to whether or not Vision Zero is merely a pronouncement or a serious policy initiative by this mayor. Janette Sadik-Khan and Paul Steely White. Photo by Ted Ullrich. Getting further into Vision Zero, the idea of completely eliminating traffic deaths and injuries and prioritizing safety over speed and mobility is so radical in America and especially New York City and will require a fundamental shift in how we think about streets. Can New York do it? In Vision Zero we do say that we are putting safety ahead of mobility, but it’s important to point out that it’s really perceived mobility. It’s a false dichotomy to say that we’re going have either safety or mobility. Lots of the time, even most of the time, the same street improvements that keep people safe also make our streets function better as transportation corridors, especially if we’re considering those who are traveling by bike, foot, or transit, which in New York is the super majority of commuters. It’s a false choice to say it’s one or the other, but you’re right, in Vision Zero traffic safety is the most important thing. The symposium was really a wonderful coming together of advocates in New York, around the country, and around the globe. We’re taking on this seemingly impossible goal, recognizing that it may take years to get to that zero number, but the goal is all important. Without adopting Vision Zero as a goal you are still, even implicitly, saying that a certainly number of fatalities is acceptable. And you’re going to speak about this balance between level of service and keeping people from being killed. Once you get that into the light of day, I think most people see how inhumane it is to have anything but Vision Zero. It’s great we’ve gotten past the early skepticism of whether or not Vision Zero was the right goal. I think there’s near-universal consensus that there’s really no other way to have it here in New York. Now the only question is how quickly we’re going to make progress. Year two here in New York City is going to be the most important year. We’re going to see whether or not we’re going to move the needle. Now that we have the framework, now that we have the responsibility for traffic safety, we need the accountability for bringing that number down. We’re going to be expecting big things from our mayor in terms of capital investments and in terms of holding reckless drivers accountable for their actions. We need to achieve for dangerous and reckless driving what we did against drunk driving decades ago. It became socially unacceptable and drivers understood that they had a responsibility. By the same token, drivers need to understand whenever they are behind the wheel they are potentially wielding a deadly weapon. We’re still not there yet. If a driver injures someone while committing a traffic violation it’s still an “oops” moment here in New York. Cops don’t investigate the crash scene. DAs, even when the evidence is there, aren’t pursuing meaningful charges. We still just don’t have that social stigma and cultural realization that driving is an extraordinarily grave undertaking. That when you get behind the wheel you absolutely are responsible. Is there a concern that Vision Zero might end up as some sort of safety-washing lip service to the issue as opposed to cities actually doing the work necessary to accomplish those goals? We have to protect the brand, if you will. The danger, as you imply, is that Vision Zero starts to mean everything that anyone wants to do then becomes meaningless. That was a big goal of the symposium–to really begin establishing the benchmarks and defining why Vision Zero is different from business-as-usual traffic safety policy. The 10 Principles that came out the symposium really speak to the growing community of people invested in protecting the Vision Zero brand and ensuring that it’s not watered down. That’s really the watch dogging we’re doing here in New York City and that advocates around the country are doing. The vulnerable road users and those who defend them own Vision Zero and we need to keep that ownership in our camp. We can’t let it get co-opted by the old guard of “business as usual, try not to hurt anyone, and if something happens well wrong place, wrong time.” That’s the old thinking of drunk driving before MADD stood up and said enough. Vision Zero says enough. We need to put human beings first. Biking as transportation feels like it’s having a bit of a moment right now in big US cities as DOTs move towards implementing better infrastructure, city councilors stump on their biking credentials, and mayors recognize publicly the need for safer streets. How do we–average jane bicyclists and advocates alike–keep that going? Really it’s activating new allies and new constituencies. There are so many natural allies of humane, complete streets. I’m at my best when I’m not speaking directly to power, but supporting another voice who is more effective than me. Whether that’s a local business owner or a survivor or a medical professional. Certainly we at T.A. will always be a loud, articulate voice for doing the right thing on our streets. But increasingly over the years, our job is to activate unsung others. You need to get beyond the one-note band of traditional bike advocacy towards a symphony of support from all corners of society. Politicians aren’t compelled to act unless they’re hearing it from multiple angles. To do that you’ve got to embrace an agenda that goes beyond bicycling and is more about inclusive safe streets. That’s what we’re forging. Our message to ourselves and my message to anyone who’s listening is you’ve just got to strive to get outside your comfort zone, meet new allies where they are, and find the common ground, give them all the support they need. Often times it’s one particular street that’s at stake. If you show up and make your voice heard you actually can and will make a difference. After that meeting go back and explain to people why what they did mattered and why progress is being made. That’s the cycle of change that combats the apathy that most people have that city government doesn’t work for them, that improving a street is an impossible task. I think we’ve broken out of that and now have this virtuous cycle of streets continuing to get better. Once you spark that, just keep it going. Like what you read on The Bicycle Story? Support the work with a donation, by buying a shirt, or sharing it with your friends. This entry was posted in Advocacy, Interviews and tagged cycling in new york city, cycling in nyc, janette sadik khan, jon orcutt, mayor bloomberg cycling, mayor de blasio cycling, new york city dot, paul steely white, streetspac, t.a., trans alt nyc, transportation alternatives, vision zero. Bookmark the permalink. T.A.-inspired idea mainstreamed: White guys in suits rolling wedgies. I can see how that’s all you got from the article, Paul!